Samaritan’s Purse President Franklin Graham and Dr. Kent Brantly appeared with Greta Van Susteren on the Fox News Channel Wednesday night, hours after attending a White House event that honored the heroism of health care workers fighting Ebola in West Africa. Dr. Brantly is the Samaritan’s Purse doctor who survived the disease that has killed almost 5,000 in West Africa. He introduced President Barack Obama at the event held in the East Room of the White House. Dr. Brantly served with Samaritan’s Purse in Liberia. He was treating victims of the disease at our case management center at ELWA Hospital near Monrovia when he contracted Ebola. He was evacuated to Emory University Hospital, where he became the first person treated for Ebola in the United States. He has donated blood plasma to other patients since recovering from the virus. Obama said the health care workers serving in Africa are a “shining example” to the world. Franklin Graham and Dr. Brantly’s wife, Amber, were among the several hundred guests at the event. Kent and Amber visited the White House more than a month ago, shortly after he recovered from his battled with Ebola. 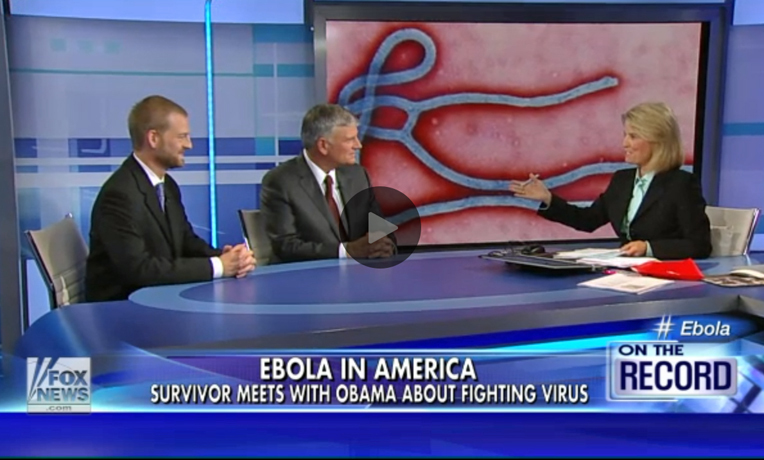 They discussed their meetings with White House officials to discuss what can be done to battle the deadly virus. Franklin Graham talked about the difficulties of getting supplies into West Africa. Samaritan’s Purse already has sent one airlift into Liberia, and another is scheduled for next week. Franklin Graham told Van Susteren he is glad to see the president spotlighting Ebola. “No question I think his administration is aggressive on this issue,” he said. “I think they would admit they are late on some of these issues, but they are focused on it now. Van Susteren has been an advocate of Samaritan’s Purse on her program and on her blog. She has reported on our work in northern Iraq, North Korea, South Sudan, Haiti, and Alaska. Because of her reporting on behalf of the people of Haiti in the aftermath of the earthquake in December 2010, an orphanage constructed and supported by Samaritan’s Purse is named in her honor.